Jamie Bradley and Garry Williams have been tinkering on their stageplay labour of love since 2014, and it's finally coming to fruition. 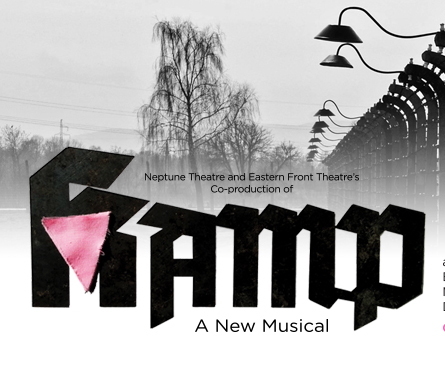 Teaming up with Neptune Theatre and Eastern Front Theatre, the writer and composer/lyricist have put together KAMP, a play about gay prisoners who begin a cabaret while in a Nazi concentration camp in WWII. This satirical, comic and deeply tragic tale is informed by real-life events in Germany in 1943, and inspired by actual people and events. Writer Bradley remained committed to telling tragedy in a comedic way. "You can't get much more tragic than Nazi treatment of prisoners, and it's a grand tragedy. But we also needed to show the spirit and joy of these men as they remained artistic and tried to rise above," he said. "This is about people overcoming adversity, and the audience needed to feel for these characters. It's hard to have people laugh at the holocaust, so we had the characters making light of their own situation." He was focused on finding light moments in a difficult play, and hopes he achieved it. "Historically, with queer art, people have laughed at the wrong things. Where straight audiences are concerned, there was a tendancy to laugh at stereotypes queer characters in TV and movies," he said. "But we want people here to share in the campiness. I'm a straight, married father of three, and I just thought of this as writing about people who happen to be queer. I hope we've done the history and people justice." Garry Williams, an openly gay Haligonian and fixture in the queer theatre community, says knowing the show will finally open in October is both thrilling and daunting. "We have history and stories that are so precious here, and they were in danger of being lost. It's so exciting to have a large troupe of performers, designers and a director who are so keen and determined," he said. Williams first became familiar with the subject matter while visiting a memorial site for a concentration camp just north of Berlin. "I looked at this catalogue of gay mens' lives, and how they ended or were forever changed. It's a story of men in a camp who set up cabaret nights in the camp," he said. "There were times writing the lyrics where I'd need to stop writing. I'd be sobbing. It was so visceral and personal, and we're in a strange place and time right now. Countries are experiencing hatred, violence, discrimination and persecution of queer-identifying demographics." He discusses the push by himself and Bradley to have queer representation on the production. "We made sure there were a large number of performers, designers and production staff who identified as queer," he said. "They came together and handled the material with care, and this allowed queer production members to build beautiful bridges with those production members who don't identify as queer." Williams and Bradley worked together to unpack the history and figure out the best way to tell it. "The title 'KAMP' for me, refers to the literal concentration camp and also the aesthetic of campiness. We are treating the heartbreaking in a frivolous way, and perform under the guise of dark humour. The subversion of reality helps," he said. "This incorporation of drag, making fun of their captors and using wit and humour as a way os survival ... It was true to the queer community." As we continue to see queer people who feel trapped, Williams says the community rises above, and shares laughter, sorrow and sentimentality together. So with Bradley's vision as a straight, married man, and the queer vision of Williams, the two had the perfect marriage for telling this story for a broad audiences. "No matter how singular the vision, extra eyes, minds and experiences are always a benefit. At times, it's precisely because characters, situations, plots and songs are from a different perspective that material resonates," he said. "Queer artists helped develop, laughed, cried and put our souls into it. But straight actors have also been able to weep, chortle, and have this be accessible. We have done something where neither the queerness gets erased and there's a way in for those who don't life a queer lifestyle." Williams is so excited to share the brainchild of Bradley and himself. "I'm so excited to see this. Performers and audiences will come to this story with an innocent ignorance, as this isn't taught or told much," he said. "I was worried these stories were at great risk to be lost, so Jamie and I had to bring this to a large audience. We hope, with this, we may spark interest and awareness of queer history that isn't readily accessible." The play runs from October 23 - November 11, 2018 at the Neptune Theatre. For more information, go to http://www.neptunetheatre.com/default.asp?mn=1.22.489.